The Toyota Rav4 has been around since the dawn of South Africa’s democracy. And like our beautiful country, it has changed dramatically over 25 years, and five generations. It’s safe to say Toyota is one of the world’s more conservative automakers and that’s not necessarily a bad thing. It’s based on the firm’s new global architecture platform, the same as the new Camry, and offers a 30mm longer wheelbase to increase to 2690mm, this is despite a shorter overall length by 5mm to measure in at 4.6m long. Toyota will offer two engine derivatives (both naturally-aspirated petrol units); a 2.0-litre, producing 127kW and 203Nm and the 2.5-litre producing 152kW and 243Nm. The big improvement is the 8-speed automatic gearbox over the previous generation’s transmission. It shifts seamlessly and marries well with the engine’s power, offering a comfortable drive along the N2 from Richard’s Bay airport to the overnight stay. It’s a supremely comfortable car on the national road as well as the gravel section I travelled on. As mentioned on all-wheel drive (AWD) models, there is a rotary controller to change the drive mode. Two modes are available: ‘mud and sand’ and ‘rock and dirt’. Toyota reckon it has a winning formula with the new Rav4. Its front-end might have taken a dramatic change but the rest of the SUV maintains the Japanese SUV’s DNA. It’s a handsome SUV and looks more robust than the previous generation. 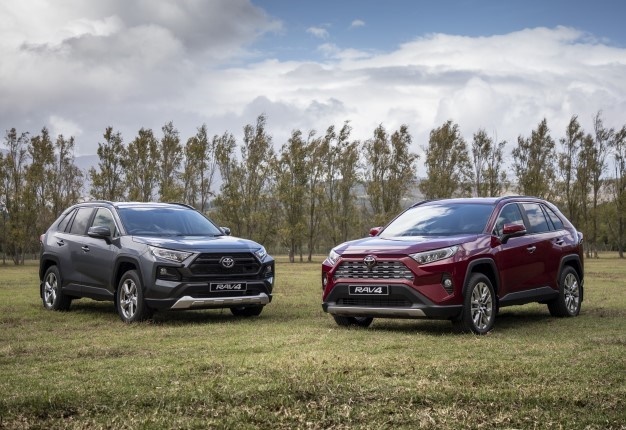 Overall, the Toyota has muscled in with a Rav4 to battle each rival, from the front-wheel drive models to the all-wheel drive VX with its splendid 8-speed automatic. It’ll continue to go from strength to strength in the segment.